The summer is almost here which means it is time to have some fun in the sun and in the water… so consider getting SCUBA certified! SCUBA diving offers a wonderful marine world with lots of adventure and new things to explore. It is also the perfect activity to de-stress from your workweek and have some time to yourself because there is no talking underwater! SCUBA can also be a great family activity because certification for kids begins at age 10. If you are not sure about SCUBA diving you can take a Discover SCUBA course or jump right in and take an Open Water class. So what are you waiting for…take the plunge and get certified! Are you fit for SCUBA diving? All SCUBA certification classes will have a medical waiver to fill out with questions about your health history. It is a good idea to review this before signing up for a class because if you have a “yes” to any of the medical questions you will need a doctor’s signature clearing you to dive. It is always a good idea to check with your doctor before doing a new physical activity anyway. Also, you do not have to be an Olympic swimmer, but you will have to pass a little swim test for your SCUBA certification. How do I choose a dive center? Whether PADI, SSI, NAUI, or SDI, you should make sure that you are taking your certification class from a reputable dive center. Going in to the shop to meet the staff and instructors in person is a great way to get a feel for your experience. While there are deals to be found on Groupon and Living Social - buyer beware. Some of these SCUBA class deals might seem attractive and affordable but there can be hidden dangers. If you decide to learn from an independent instructor, you must be careful that they are represented by a certified SCUBA agency. The danger of instructors who are not represented by PADI, SSI, NAUI or SDI is that you will not receive a certification card that will be requested and accepted by dive operators both here in Florida or internationally when you go out on a dive trip. Some will have hidden fees, or the not share with you that you will be in a very large group class. It is also good to look at the online reviews for the dive center to see what others have to say and ask trusted friends for recommendations. Academic learning -- what are my options? There are several ways to take your Open Water SCUBA class. You can work with a book followed by a class or you can take an online course. Book learning requires you to do independent reading and answer review questions. You would then meet with your instructor in the classroom to review the chapters, view videos, complete quizzes, and take a final exam. This means more time in the classroom and more time with the instructor. The online course was designed to eliminate a long classroom session by allowing the student to independently view the course, videos, quizzes and final exam all at your own pace in the comfort of your own home. So if you only have a few days to take this class, the online course is a preferred method. Once you have passed the final exam, whether by book and classroom or e-learning you would then meet with your instructor for review, go with them to the pool for pool class, and ultimately out to the ocean for your “open water” training. At most dive centers SCUBA equipment rental is included in the course. Some dive centers require you to have your own mask, fins, and snorkel. There is an advantage to owning your own gear and most shops offer a student discount when you sign up for a class. Having your own mask, fins, and snorkel not only ensures equipment that properly fits you but also gives you comfort and confidence to succeed at the SCUBA skills. Another item you might want to own is a wetsuit, the fit and comfort of which will be an advantage to your diving. Wet suits come in different thicknesses for different conditions. The dive shop is the best place to find out which type of wetsuit will be right for you and the type of diving you will be doing. 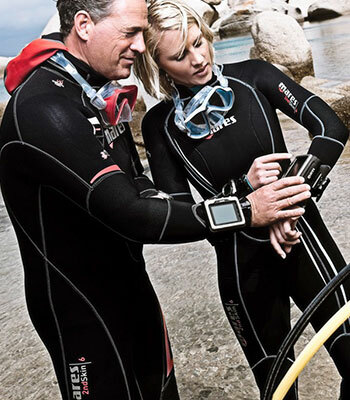 If you plan to learn your dive profiles on a computer, then consider purchasing a dive computer so that you can use it in class and your instructor can help you plan dives with it. There are many dive computers on the market and for rent that the one you learn on in a class might not be the one you dive with after certification. The sales people in the dive shop are dive professionals and they can advise you about which dive computer is right for you. It is very important to know how to use your dive computer so that you stay safe while diving. Absolutely! Slipping beneath the waves to explore the critters and reefs that live underwater is fascinating. The feeling is very much like flying! Underwater you are neutrally buoyant and this allows you to feel weightless. It has also been said that diving it a great form of exercise, you can burn up to 500 calories per dive! But diving is not just good for your body it is good for your mind. As we stated above it is a great activity for stress relief but can also help you build self-confidence and new friendships. Dive boats and dive shops are a great way to meet new people because divers love to talk about their favorite dives, which can encourage you to dive more so that you too can share these experiences. The ocean is not predictable, you never know if you might encounter a neat critter, a sea turtle, a goliath grouper, a lobster or maybe something rare, like a whale shark! Come on! Get certified and let’s go diving!